The track "Helter Skelter" is a The Beatles cover. Wow! my mint sealed copy shows the same exact first stage of ring wear at the top and bottom on each side. Does anyone else show the same on their copies, or did I just happen to find the exact copy shown in the image? Does this use the Kevin Gray remastering as the 2008 & 2016 reissues use? Mine has as above but has STE-60289-A-5 rather than STE-60289-A-3. Is this a variant? Solid sound quality, maybe an 8.5 out of 10 stars. Mixed at a lower volume than today's standards but there's very little noise floor so you can turn it up, which you should do anyway! Nice tight sound across both sides, evenly mixed instruments - nothing stands out too prominently in the mix except maybe the vocals which aren't overwhelming. Good channel separation, but not ultra-wide. I think most of the recent reissues were cut from CD, most sound quite different and IMO not nearly as good. As with most vinyl of this era, an original is often best. This is CUT from the analog master tapes. Kevin Gray, wonderful, a better remaster/reissue of this record will be a long time, if ever coming. Really is german press but sold in Spain or with a spanish sticker. The spanish press come without gatefold sleeve and show a spanish adress: Condesa de Venadito 1, Madrid, this press havent. No counterfeit. Why is blocked for sale? This album really started a fire, there was before SATD and after SATD. Saw this tour when they opened for Ozzy, most of the crowd was there to see Crue. Did they live up to the 1st 2 records, not really, but they did start some wild times. If looking for a vinyl copy, stick with the original. 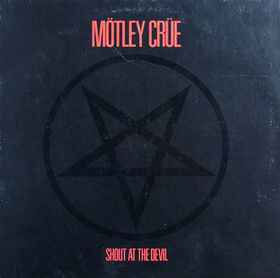 Shout at the Devil is a must have for all metal fans. Quality is really strong considering an old LP. Crisp and loud treble parts. Gateway sleeve a bit damaged.